Top 4 Reasons We Need Stronger Gun Laws...or Maybe Just Less Guns? That second part has people all riled up, but it's true. Guns have changed the lives of so many Americans for the worse, and it's time to stop just the candlelight vigils and take real action. Sure the Constitution provides for a right to bear arms, but are we certain it wasn't geared toward the Militia mentioned? The role of legislators is to keep our laws current and relevant to the times. Can we be sure it has been done in this case? 1. Gun results are pretty permanent. Of course, people have survived gun shot wounds, but for the most part, there is no turning back from a bullet. The reason for it's use is to kill the target. This is also a great contributor to murder-suicides--because once the killer realizes they've done something permanent and can't live with themselves--they don't. We need to make sure our laws are deliberate about who can get and keep weapons. Everyone has wondered if they've turned off what they needed to before leaving home, or put things away they should have. Guns are included. 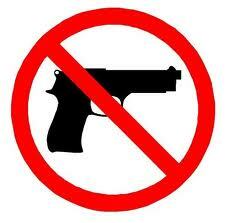 Guns in households make for an added stress to keep vigilance over and be sure no accidents occur. Guns at home increase the chance a child will find it, and misuse it to detrimental results. It's not quite the same as leaving a curling iron or television on. Just last week a father accidentally shot his 7-year old son after leaving a gun shop. In September, a father shot his teen son in error. These things happen all the time, and it's not just people with mental issues. Anything can happen, anywhere. 3. More guns, more problems. 4. Our laws should protect, not hurt. Do you talk like this? Is it easy for your to understand? This provision has been in court for interpretation time after time. It's largely because it has not been updated over the years to keep up with what's happening in the country and how people communicate. Think about it this way: Why is a ban on texting and driving missing from the Constitution? Bottom line here, we need social policies fit for our current society, not from a society which had no way of knowing what would come ahead. It is always sad when we have to address issues like these, but the task is addressing them and doing something about them for better days ahead. Let's make sure the right message is out there, and protect ourselves against the next tragedy.